Radio recorder & player with 100,000 internet radios records targeted music from radios of 10,000,000 songs of 1,000,000 albums of 870,000 artists and tags music automatically with ID3-tags, album cover and lyrics. Including music organizer, audio- and ringtone-editor. Connects your devices to a personal media cloud. Music universe finds similar music. Cloud-Manager. 120,000 of the best podcasts. All music-TV channels of the Internet. Record targeted MP3s. 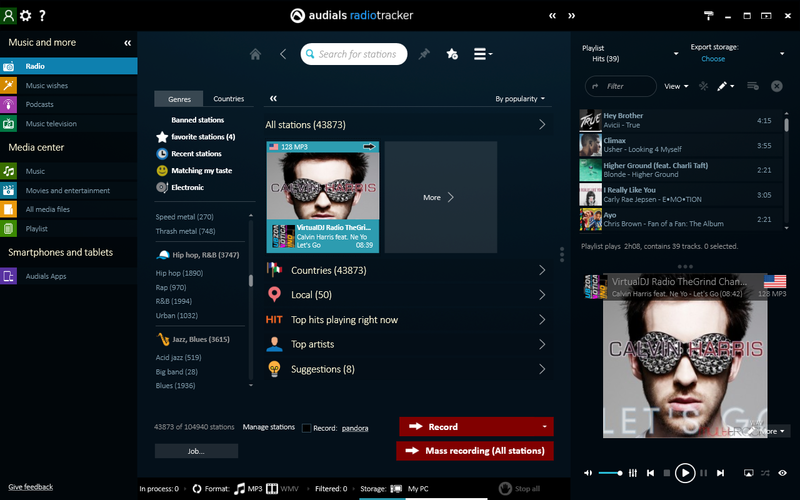 Enjoy any Radio Station, Music or Podcast anywhere++Audials Radiotracker - At a Glance++Player and recorder with 100,000 Internet radio stations. Record targeted MP3 tracks via the Wishlist. Automatic ID3 tagging, album artwork, lyrics. Audio editor. Music management with the Music Universe. Clouds. Podcasts. MusicTV.++The most popular Radio Player++ Radiotracker delivers the best and most radio stations thanks to the massive radio database, and sorts stations by genre, language, country, region and even artist. The preview function gives you live information on the music currently being played before you tune in, and recommendations to similar radio stations as well.++The massive Selection: 10,000,000 MP3s & 1,000,000 Music Albums++Radiotracker uses a one-of-kind technology to automatically and legally fulfill music wishes. Simply select artist, album or individual song and Radiotracker uses the Audials network to find the right radio station, automatically record the desired music and save the track as a private copy on your PC.++Social News of Radio Stations and played artists++ With Audials Radiotracker you can access the social news from Facebook and Twitter of the radio station and artist that is currently being played.++Perfect edited Music in Music-Shop Quality up to 320 kBit/s++Radiotracker edits the song beginning and end, while also normalizing song volume automatically. Talk and commercials are removed.++Bonus: Podcasts and Music TV++Comprehensive directory with 120,000 international podcasts. Subscriptions monitor and automatically download new episodes. Shows can be played back directly. All major music TV stations.